Visual Art School Visit (Power Point and 'hands-on' objects) Activity Sheets with theme. Different themes for different grades. 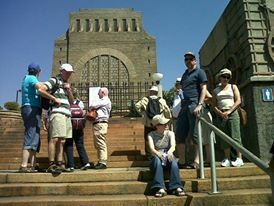 Example Traditional Venda or Zulu culture; Life style of the Afrikaner pioneer; Early Pretoria history; San Hunter gatherers; Mapungubwe and Schroda (clay figurines); Timbuktu and Mali; The first cattle farmers in South Africa; Trade over time; Ancient Egypt; Democracy and citizenship in South Africa; Colonising the Cape in the 17th and 18th century; Communication over time; South African heritage SS & Life Science; Medicine over time; Cooperation and conflict on the borders of the Cape Colony of the 19th century.